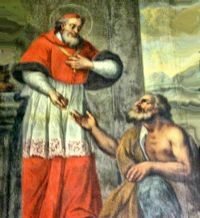 Born at Meulan-sur-Seine, France, St. Gaucherius received a good Christian education. He gave up the world at the age of eighteen. He became a solitary in the forests of Limoges with his friend, Germond. He attracted many disciples. Gradually a community grew and he organized them into St. John’s Monastery. St. Lambert, Faucherius and St. Stephen of Gramont were trained in this community along with many other holy men. He was the abbot. He also founded a convent for women. He died from a fall from a horse while returning to Aureil from Limoges. He was canonized April 9, 1194. Glory and praise for ever! We can always enter into contemplative prayer wherever we are. True or False?